My parents came over for dinner last night. I was excited to have them over, but ran into a bit of a dilemma. Those of you who've been following this blog for a while will know that I intend going vegetarian this Lenten season. I was determined to not let this visit come in the way. So using my previous post as inspiration I got to work and I'm glad to report that we had the loveliest dinner. I whipped up some of this Paalak Paneer and a platter of Eggplant Patties. The original eggplant patties recipe uses egg in the batter, but yesterday I just left the egg out and they turned out really well even without it. 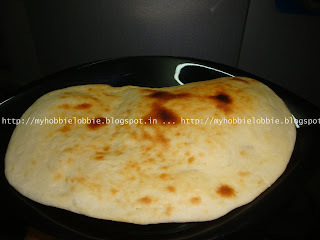 To round it off, I made some baked naans and that's what I want to highlight in today's post. This is just the second time I've made these naans but I can swear by them, they're that good. Those of you who've ordered from local eateries will be used to the rubbery and extremely chewy pieces of cooked dough they call naans. Friends, you have no idea what you've been missing. Try making these naans at home and I know you'll be as amazed as I am. But don't take my word for it. Try it out for yourself and let me know what you think. These are really easy to make. I made the basic butter naans yesterday, but you can use an array of toppings of your choice ranging from herbs to garlic to cheese, pretty much anything you fancy. Serve these up with your favorite Indian food. While savoring these yesterday, I realized that they'd be ideal for making wraps as well. So when we resume meat in our diets, I'm gonna try that out for sure. I couldn't get a picture of the whole batch of them as they we disappearing faster than they came out of the oven. This is one I managed to get a shot of. Maybe, I'll have better luck next time. Till then I guess this one will have to do. In another bowl mix the milk and oil and use this mixture to knead the flour to a pliable dough. This should take about 8-10 minutes. You can use a little more milk, if needed, to knead the dough, if its too dry. Cover with a damp tea towel and keep in a warm place for about 15 minutes. Preheat the oven to about 170ºC on the grill mode and place a baking tray high in the oven under the grill. Divide the dough into 10-12 portions depending on the size of the naans you'd like to make. Drizzle a couple of drops of oil on the baking tray. I did this just this one at the onset to prevent sticking. Place the rolled out dough on the baking tray under the grill for 2-3 minutes till they puff up and lightly brown. Flip them over and let them get a few brown spots on the other side as well. Take them out of the oven and brush them lightly with some butter. Keep an eye on them as they can start to burn in the blink of an eye. I like the idea of baked naan and you are right they would be perfect for wraps of any kind! Perfectly prepared naan's !! looks delicious !! Your welcome Miriam. Thanks for stopping by! Thanks for sharing you Naan recipe! I've always wanted to make it and now I can. :) Looks perfect. We really enjoy this recipe and I hope you do too! I've always wanted to bake my own naan at home. Now I have not excuse not to try. Thank you so much Trisha! I have never made naan before but would love to. We had an authetic Indian restaurant that made the best naan--it was my first naan experiece and I got addicted but the place closed. Looks like I'll have to make them at home. Thanks for a great recipe! You'll enjoy these for sure! Your naan looks wonderful! I've tried making it at home once, but slightly unsuccessfully.... I just love the taste and smell of a fresh made naan... and with some delicious curry to eat with it... getting hungry now!!! Thanks Maria, I hope you have better luck with this version, enjoy!